The Panel Conference, "Community Responsibility – Community Preparedness", is one of the major events taking place within "The Third Laniado Hospital Week" between June 4th to June 14th in Los Angeles. Nessah Congregation is the Host Sponsor of the event. 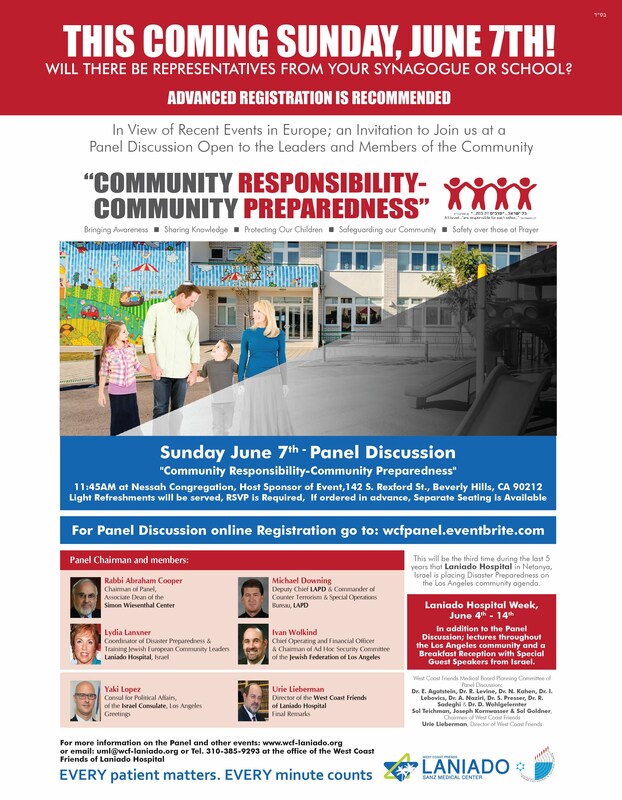 Panel Conference, "Community Responsibility – Community Preparedness" 1145AM on Sunday, June 7th , 2015 at Nessah Congregation Simcha Hall, located at 142 S. Rexford St., Beverly Hills, CA 90212. The conference is open to the lay leaders, spiritual and educational leaders of the community to raise their awareness on the subject of security and community preparedness. Laniado Hospital sees its communal responsibility to share its world expertise gained under very unfortunate circumstances and to help create an environment for community preparedness in Israel and in Jewish communities overseas.